Rakusan did not include the Fan Series in his main sequence numbering. Therefore, the original number used for each of the 36 Series prints has been modified to identify the Fan Series members of its theme. The five different fan silhouette shapes have been here assigned arbitrary numbers 1 through 5. To indicate a fan design these shape designations are added to the 36 Series number separated by a hyphen. 112-2 is the Fan Series design with fan shape 2 in the 112 Pomegranate theme. Like all other designs in this series, 112-2 was only produced in a single print run, and few copies are currently documented. The individual designs in the 112 Pomegranate theme were completed in at least two stages. Two of the five fan designs (including 112-2) and the 36 Series design 112 have seal C which indicates a carving date during the first half of 1934. One of the other fan designs (112-3) has seal R which is a rare minor seal whose carving period has yet to be established. The other two fan designs have seal B which indicates a later carving period closer to the time of publication. The composition of 112-2 includes a forking pomegranate branch with a few leaves and an immature fruit. Sitting on one of the branches is an unidentified small songbird. 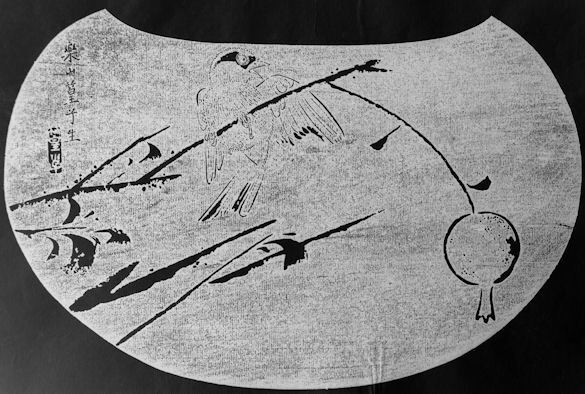 The loose, but essentially linear, technique used in rendering the pomegranate displays equally well in the ishizuri version or the original. However, the areas of dark and light on the bird are probably correct only in the original, and the ishizuri version is a true negative. The small passerine bird in 112-2 remains unidentified. Its most distinctive features are a strong eye-ring and a black mask. There may or may not be some dark markings on the outer wing and tail feathers, but the rest of the bird is apparently a solid color. It has been temporarily called 'songbird' here, 小鳥, ko-tori, lit. 'small-bird'. 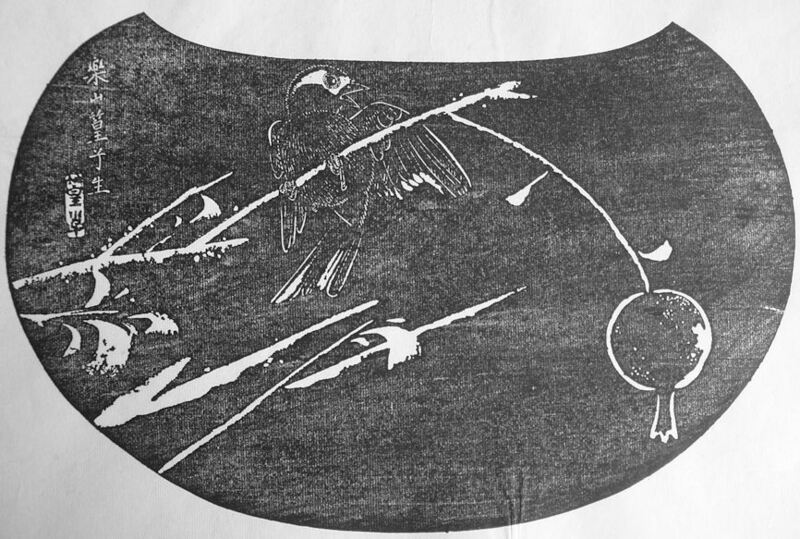 Another temporary alternative name could be 雀, suzume, which remains a very common general name for any sort of small sparrow or sparrow-like bird in modern Japanese.